In the U.S., they say there is even more corruption on the local governmental level than the Federal, because that is where all land use decisions are made. The same seems to be true in Korean—and Mayor Park Sung-bae is glad of it. He is determined to get all the prime cuts from a plan to redevelopment a former U.S. military base in fictional Annam. Of course, he has plenty of other nefarious side businesses, including a large meth dealing operation. For years, Det. Han Do-kyung has done the mayor’s dirty work, but an ambitious prosecutor will force him to either double down or turn state’s evidence in Kim Sung-soo’s spectacularly cynical Asura: The City of Madness (trailer here), which opens today in New York. In his world-weary voice-overs, Han refers to himself as the mayor’s “gun-dog.” He means it the way it sounds. Having done some pretty despicable things for his boss (who also happens to be his cancer-stricken wife’s half-brother), Han is poised to accept a position in City Hall as his reward. Unfortunately, things fall apart rapidly when an equally venal but less connected fellow cop interrupts him paying off the junkie who recently kidnapped a witness against the mayor. During the resulting scuffle, Han accidentally kills the crooked copper, forcing him to frame his drug-addled lackey to save himself. To further complicate Han’s life, prosecutor Kim Cha-in starts blackmailing Han to inform on Park. Facing his wife’s impending mortality has made Han remorseful for choosing the crooked path. However, he can tell Kim is no Fritz Bauer or Rudy Giuliani. In fact, he might be just as ruthless and sociopathic as Park. Asura (rather poetically named after constantly warring Buddhist demigods) makes recent Korean political corruption thrillers like Inside Men and A Violent Prosecutor look like The Smurfs. No mere ward-heeler, Mayor Park is practically the Devil incarnate. 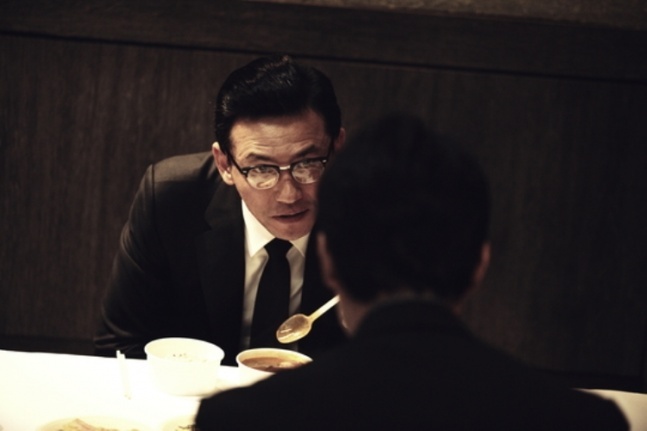 Of course, the flamboyantly devious pol is totally in Hwang Jung-min’s wheelhouse. He gleefully gobbles down the scenery and delivers insanely villainous pronouncements like Mussolini on the balcony. In contrast, Jung Woo-sung is relatively restrained, but watching the cumulative punishment of all the smack-downs he endures also represents quite a compelling performance, but one of a wholly different order. Amidst this world of shady characters, Kwak Do-won also stands out as the cold-blooded Kim Cha-in. If you are looking for subtlety here, your best bet is Jeong Man-sik, who brings some finer gradations to Do Chang-hak, Kim’s lead investigator, at least when he is not beating on poor, degraded Det. Han. Tight, tense, and bracing like iced black coffee, Asura could be the least sentimental film of the year. Kim Sung-soo never gives viewers anyplace to hide, but he pays them off with third act mayhem worthy of Johnnie To at the top of his game. 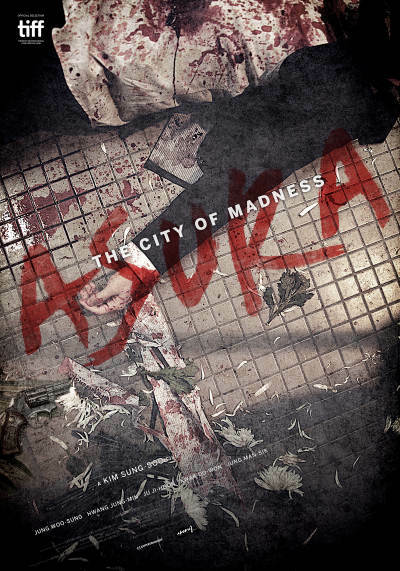 Very highly recommended for action and procedural fans, Asura: The City of Madness opens today (10/14) in New York, at the AMC Empire.